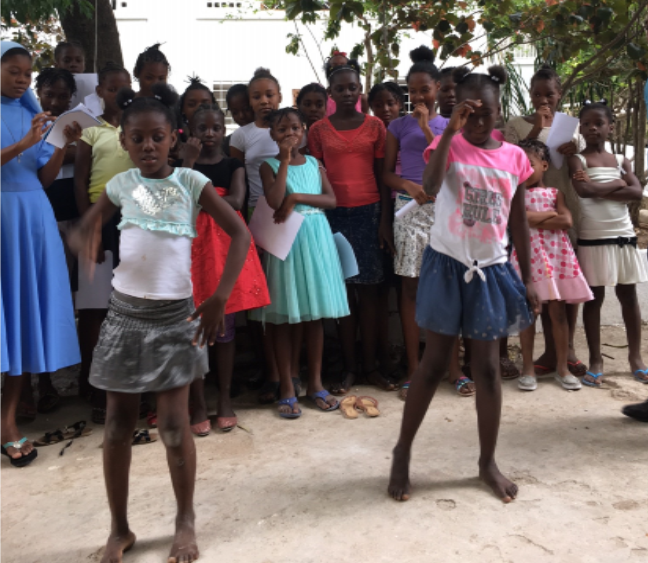 GIRLS AT HOME—The young orphans perform a dance for in gratitude for the house we helped purchase through our parish tithe. Two weeks ago, I wrote here that I’d rather stay home in Grandville than travel to Haiti. Today, I am immensely grateful that God made me go. Five of us from St. Pius X returned late Wednesday after spending eight days in Haiti as guests of Sr. Luvia Joseph. We support her ministries with our Master’s Mission tithe. For Michele Stutzky, Bill McInnis and me, this was a return trip after six years. We were joined by first-timers Julie Utrup and Brian Stoffer. The group also included seven parishioners from St. Joseph Parish in Pewamo, and two videographers, who are creating a mini-documentary about Sr. Luvia. Once again, Sr. Luvia surprised us with her hospitality and the scope of the communities she has been building in Haiti since the 1970s. Just when we think we have listed all that Sr. Luvia does through her order, the Missionaries of Christ, Mary and St. Alphonsus for the Family, we discover something we didn’t know. This we learned while visiting two schools, three different houses for orphaned girls, a convent, and a house for seminarians studying for the priesthood. These were all in Port-au-Prince, which is densely populated with narrow streets and crazy traffic. One day we traveled to the island’s southern coast and visited the city of Jacmel, where Sr. Luvia has a community of brothers who operate an elementary school. One highlight of our time in Port-au-Prince was an evening at the house we helped Sr. Luvia purchase in 2015. It was obvious that the residents had prepared for our arrival. The house was tidy and the girls staged a performance of songs and dances for their guests. BOYS AT SCHOOL — These guys were happy to pose after class St. Alphonsus School, which also gets our financial support. “Even five months before God takes my life away, I want to be doing something to help people,’ Sr. Luvia said through our interpreter, Jean-Paul Polynice. At the age of 66, Sr. Luvia struggles with many health issues. Throughout our stay, a member of the group worked to line up better treatment for Sr. Luvia’s asthma — provoked by polluted air because trash is still burned daily and air conditioning is scarce. Yes, there were times when her fatigue was evident. But somehow, each day she mustered up her God-given strength and joyfully led us along. That is just one of the myriad of reasons why I am so grateful God took us to Haiti again—to show Sr. Luvia our support and God’s love.